Roger Federer became the first man in the ATP Open Era to record 50 match wins at 3 ATP Tour events (Halle, Basel, Indian Wells) as he overcame a dogged serving resistance from Dr. Ivo Karlovic 7-6 (3), 7-6(4) in an hour and 28 minutes to reach his 10th successive final at Gery Webber Open. Overall, Halle is now the 7th event where in Roger Federer has won 50 or more matches. As expected there were no break of serves in both the sets. 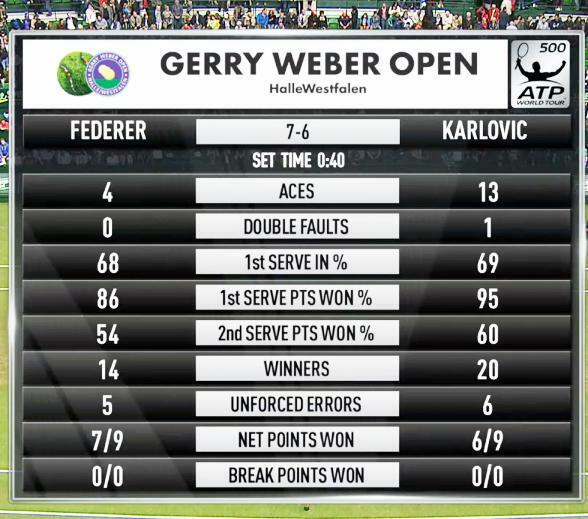 In the first set, Karlovic had a couple of deuce on Federer's service, but Federer was up to the task & it was tie-breaker time. Before the start of this match, Federer had won 13 of the 16 tie-breakers. 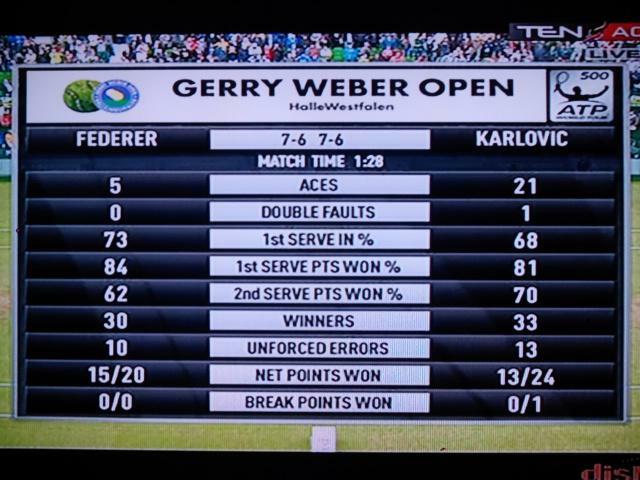 The second set was no different, just that Karlovic had one break point. Karlovic during the course of the 2nd set (his 20th ace of the match) served his 114th ace of the tournament. With this, Karlovic bettered his own record of 113 aces that he set in February 2007 at San Jose. How ever, the most aces record in a best of three setter tournament still lies with John Isner, he set that record in 2007 Washington (144 aces). Federer won the tie-breaker 7-4 & with this reached his 10th final at Halle, overall his 130th singles final. 2015 is now the 12th year in the last 13 years (with the exception of 2013), where in Roger Federer has reached the finals of 6 or more tournaments in a year. Federer will play Andreas Seppi tomorrow in the final, Seppi reached the final after Nishikori retired due to calf injury after just 5 games.. Tomorrow's final will be Federer's 20th final on grass court. Federer is 7-2 at Wimbledon, 7-2 at Halle & 0-1 at 2012 London Olympics. Best of luck in the final maestro! Talk about a "David and Goliath" contest!! I must admit I find matches which are largely down to a serving contest a bit boring as its aces or missed returns, a lot of walking from one side of the court to the other and a distinct lack of exciting rallies, although there were a few notable exceptions in this match .... as Roger's Hot shot, featured in a post above, clearly shows. He certainly had his work cut out to figure a way past the mighty serve of Ivo Karlovic and with no breaks of serve in this match it did lead to two rather anxious tie breaks. Thrilled to see Roger seal this victory in straight sets, it was a close thing!